Dyotropic Ring Expansion: more mechanistic reality checks. I noted in my WATOC conference report a presentation describing the use of calculated reaction barriers (and derived rate constants) as mechanistic reality checks. Computations, it was claimed, have now reached a level of accuracy whereby a barrier calculated as being 6 kcal/mol too high can start ringing mechanistic alarm bells. So when I came across this article in which calculated barriers for a dyotropic ring expansion observed under mild conditions in dichloromethane as solvent were used to make mechanistic inferences, I decided to explore the mechanism a bit further. Full circle. 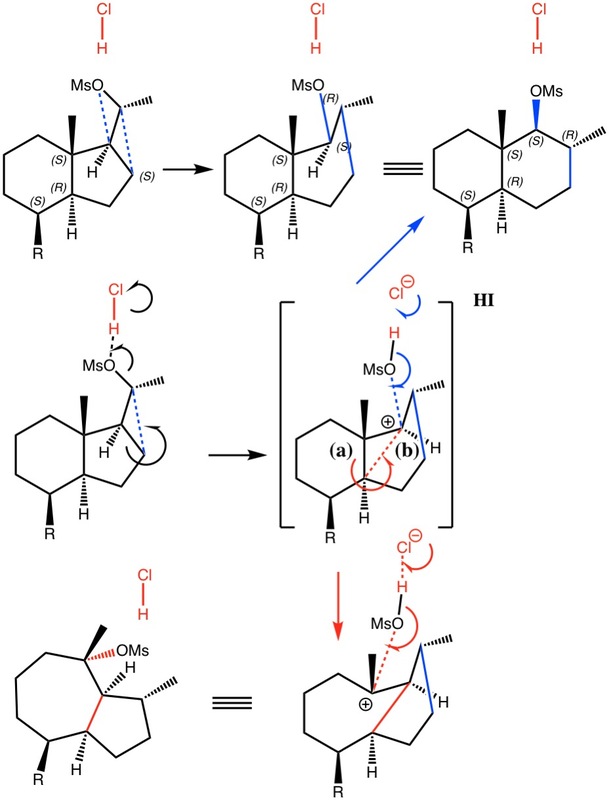 Stereoisomeric transition states for [1,4] pericyclic shifts. This post, the fifth in the series, comes full circle. I started off by speculating how to invert the stereochemical outcome of an electrocyclic reaction by inverting a bond polarity. This led to finding transition states for BOTH outcomes with suitable substitution, and then seeking other examples. Migration in homotropylium cation was one such, with the “allowed/retention” transition state proving a (little) lower in activation energy than the “forbidden/inversion” path. Here, I show that with two electrons less, the stereochemical route indeed inverts. First, a [1,4] alkyl shift with inversion at the migrating carbon (ωB97XD/6-311G(d,p)/SCRF=chloroform); as a four-electron process, this is the “allowed” route. The “forbidden” route corresponds to retention of configuration at the migrating carbon. The barriers for each process can be seen below from the IRCs. That for inversion is ~4.5 kcal/mol lower than retention. This nicely transposes the values for the six-electron homologue shown in the previous post. There is one more nugget of insight that can be extracted. The start/end-point for the six-electron process (homotropylium cation) was, as the name implies, homoaromatic. Now, with a four-electron system we also have an inverse. Nominally, we should now end with homo-antiaromaticity (but see ). But antiaromaticity is avoided whenever possible, and so the homoaromatic bond observed in homotropylium is not formed. It resolutely remains a σ-bond (1.48Å) thus sequestering two electrons, and the remaining two electrons simply form a delocalised allyl cation. With the six-electron homotropylium, reactant/product were stabilised by that additional (homo)aromaticity, thus inducing a relatively high barrier. With the four-electron system here, no such reactant/product stabilisation occurs, and hence the reaction barriers are now significantly lower. A rather neat pedagogic example. In my earlier post on the topic, I discussed how inverting the polarity of the C-X bond from X=O to X=Be could flip the stereochemical course of the electrocyclic pericyclic reaction of a divinyl system. An obvious question would be: what happens at the half way stage, ie X=CH2? Well, here is the answer. The reaction occurs in two stages (ωB97XD/6-311G(d,p)/SCRF=dichloromethane) but overall is a concerted, albeit asynchronous, reaction. The initial stage is a conrotatory ring closure (as observed with X=O but opposite to X=Be), and reaching what we will call a HI (hidden intermediate). This HI clearly has zwitterionic character, and manifests its presence most obviously at IRC = -3.5 below. The polarity of this HI is revealed by the dipole moment (6D) and molecular electrostatic potentials, below. The dipole vector goes from -ve to +ve, and the MEP clearly reveals the polarity below. This ionic HI however is not stable, and in the second stage of the reaction collapses to the neutral bicyclic hydrocarbon shown below. Overall, it amounts to a 2+2 cycloaddition, but with a very unusual pathway in which one C-C bond is very much formed before the other (which is how the reaction escapes the clutches of the Woodward-Hoffmann forbidden-ness). Why is all this worth this follow-up? Well, one can now start to “design” the reaction. All three carbon atoms with formal charges can be stabilised or destabilised with appropriate substituents. It should not be too difficult to stabilise out the HI into just an I(intermediate), or indeed to remove it from the profile. Nice perhaps for a group of students, who can partition up the substituents amongst themselves and discover if they have the desired effect. And would any of this tinkering change the stereochemical outcome? Using a polar bond to flip the (stereochemical) outcome of a pericyclic reaction. The outcome of pericyclic reactions con depend most simply on three conditions, any two of which determine the third. Whether the catalyst is Δ or hν (heat or light), the topology determining any stereochemistry and the participating electron count (4n+2/4n). It is always neat to conjure up a simple switch to toggle these; heat or light is simple, but what are the options for toggling the electron count? Here is one I have contrived by playing a game with the periodic table. The ring closure of a divinylketone is called the Nazarov reaction, it being promoted thermodynamically by coordination of a Lewis acid to atom X. Divinyl ketone can be regarded as a hidden pentadienyl cation, since the C=O bond is polarised Cδ+Oδ- in the time-honoured manner of organic chemistry. In this (formal) resonance form, it becomes part of a pentadienyl cation and can electrocyclise via a 4-electron reaction involving a stereochemical process known as conrotation. 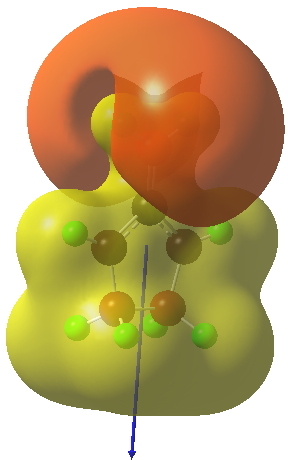 The new bond is formed antarafacially (from opposite faces) at the termini of the pentadienyl cation (ωB97XD/6-311G(d,p)/SCRF=dichloromethane.). Note that for the uncatalysed reaction, the barrier is high and the reaction is endothermic but adding a BF3 to the oxygen lowers the barrier and removes the endothermicity. So, one can play a game and ask what would happen if the polarity of the C=X bond were to be reversed. This means going left of oxygen in the periodic table, ending at Be. The reaction has a high barrier, but it is strongly exothermic.† However the most noteworthy aspect is that the stereochemistry of the electrocyclisation is now disrotatory, with suprafacial bond formation (from the bottom face in the animation below). The stereochemical outcome of this reaction has been flipped by reversing the polarity of the CX bond.‡ This little example shows how a thought game played using the periodic table can then be reality tested by solving appropriate quantum mechanical equations. In this instance, one is not going to rush into the laboratory to try to replicate the experiment, but it might help catalyse new thoughts amongst the readers of this blog. Intersecting paths in molecular energy surfaces. The potential energy surface for a molecule tells us about how it might react. These surfaces have been charted for thousands of reactions using quantum mechanics, and their basic features are thought to be well understood. Coming across an entirely new feature is rare. So what do you make of the following? Three-for-one: a pericyclic brain teaser. A game one can play with pericyclic reactions is to ask students to identify what type a given example is. So take for example the reaction below. A simple pericyclic reaction encapsulating the four thermal selection rules. As my previous post hints, I am performing my annual spring-clean of lecture notes on pericyclic reactions. Such reactions, and their stereochemistry, are described by a set of selection rules. I am always on the lookout for a simple example which can most concisely summarise these rules. The (hypothetical) one shown below I think nicely achieves this, and raises some interesting issues in the process. A simple pericyclic reaction encapsulating the four thermal selection rules. is licensed by Henry Rzepa under a Creative Commons Attribution-Noncommercial-Share Alike 3.0 United States License.